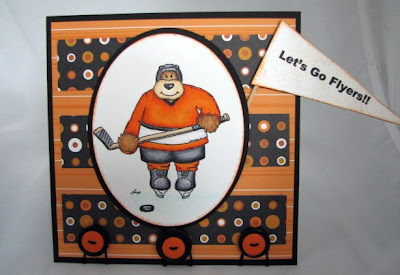 Bella Kitty Creations: Sweet Sketch Wednesday 51- LET'S GO FLYERS!!! Sweet Sketch Wednesday 51- LET'S GO FLYERS!!! I live in a Philly Suburb, so of course, I am sporting orange today, as is everyone I have seen so far this morning in my area. Why do you ask?? In honor of the first game of the Flyers in their quest for the CUP!!! I am heading to my uncle's house today for a dual purpose party, Memorial Day and the Flyers! They are die hard, and I mean DIE HARD fans. I just had to make a card to bring over with me. I hope that they get a kick out of it! I used the image Hockey Beary by Prairie Fairy Designs. I also used Sweet Sketch Wednesday Challenge #51. I made the little pennant out of plain 'ole white cardstock, using a font in Microsoft Word. Then inked it up a bit and glued it to a toothpick. I hand drew the little puck on the image as well. I hope that everyone has fun today, in whatever you may be doing! Thanks for taking a peek and LET'S GO FLYERS!!!!!!!!!!! Michelle, this card just makes me smile! It is super cute! Love your colors and fun image. wow what a fab hubbie you have. What a great birthday gift! Have fun and good luck to the Flyers!! :) What an adorable card - your family is sure to love it! What a great Hockey card! Just didn't even notice this image and you made it so perfect for the day! Thanks for playing at SSW! Thanks so much for joining us at Sweet Sketch Wednesday this week! FANTASTIC!!!! I LOVE how you used the sketch, it worked perfectly for this fun sports card! Thanks for sharing it with us at SSW!!!! LOL. I am cheering for the Flyers over Chicago since my team is no longer in it :) Awesome card - I just LOVE it!!! Thanks so much for playing at SSW. BROL! OMG this guy is fun!! So my husband is a DIE HARD Boston fan, I`m a Vancouver fan but enjoy Boston as well SO it was kind of a suckie day when Philly knocked out Boston. HOWEVER, we have a friend who just got married yesterday who is a DIE HARD Philly fan (yup here in BC, Canada) and for his wedding gift, we`re sending him what we have left over of our hockey mojo cuz now we want to see Philly kick the crap outta Chicago. hee hee Glad to see a hockey fan out there!! Oh this Hocky player card is so fun. I hvent seen that image befor all so fun. Love your colors. Have a sweet day and thanks for playing along @SSW!!! Awesome card! Thanks for playing at SSW!! Celebrate - A double challenge!